The study of behavior in companion animals, and how they handle stress, is a rapidly developing field, most extensively in the lives of military dogs. Just like their human-soldier counterparts, after combat duty, canines have demonstrated clear symptoms of PTSD. Some estimates indicate that more than 5% of the approximately 650 military dogs deployed by American combat forces have been diagnosed with canine PTSD. Much like human PTSD sufferers, not all dogs exhibit the same degree of symptoms. Some dogs have drastic changes in temperament, ultimately becoming aggressive, clingy or timid. Some become hyper-vigilant which can increase anxiety. Others will actively avoid situations in which they were previously comfortable … like the tasks they were trained to perform, often resulting in their retirement from military service. Companion animals living in households going through separation or the loss of a family member can be similarly traumatized. They can develop separation anxiety, personality changes and depression. Consequently, they may manifest negative behaviors, such as destruction, timidity or aggression. Pet anxiety can be expressed in a variety of ways, including pacing, panting, whining, destruction, loss of appetite, digging, chewing and excessive barking. The sad fact is that pet kids may be more traumatized by the sudden departure of a family member because they have no way of being prepared for the change. Another unfortunate outcome of changing human relational dynamics is relinquishment. I know that many vets have received calls from newly separated couples who see no other option than to end their relationship with their dog or cat as well. If you or someone you know is facing challenging times that could affect a pet negatively, here are some tips to minimize the impact and thus reduce the stress on your furry family member. Even though the loss of a pet during separation can be more heart-wrenching than losing money or material belongings, dogs and cats are still considered property in the eyes of the law. If retaining guardianship of your pet kid means the world to you, consider giving up something valuable, such as a car or cash, to gain full custody. If both sides refuse to budge on custody, draft a visitation plan you both can live with. Take into account post-separation schedules and living situations to determine who is better suited to be the primary caretaker. That individual must agree to completely care for the pet’s needs and make sure vaccinations are up-to-date and other medical care is provided. If you are considering the possibility of relinquishing your dog or cat, try to remember that things will inevitably get better. Chances are that you will be happier with your pet in the long run. We all know that they can be reliable sources of comfort during rough times. Consider preventive measures before a grown child flies the coop for college. If your pet kids are accustomed to someone always being home, but will soon have to spend periods alone, schedule brief outings for yourself (anywhere from 15-60 minutes). These ritual changes can help ease a pet into the upcoming transition. Wake up a bit earlier to give yourself time to play with your schedule, to see what might fit your new routine best. Once your child has gone, make time in the morning to either take your dog for a walk or play with your dog. 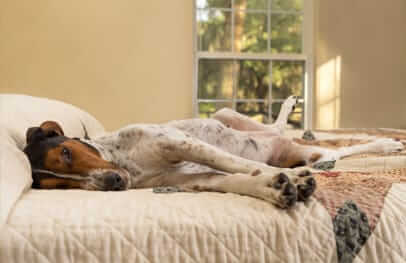 Either activity will mentally stimulate and physically exhaust your dog so that more time will be spent resting when you have to leave the house. Make departures as low-key as possible. When it’s time to go, adopt the attitude that it’s really no big deal, and quietly leave. Before leaving, stuff a treat-safe toy with food or a tasty snack. For a dog, try a smart toy that dispenses treats or kibble. For cats, no toy is required, simply hide treats at various locations throughout the house. There are several over-the-counter products created to help lower stress in companion animals. For severe cases, there are a few options available with a prescription, such as Clomicalm, Reconcile and Xanax. These medications can help with animals that are suffering from anxieties that can’t be addressed by behavior therapy alone. Regardless of the scenario, talk to your veterinarian about what will work best for your pet kid, given your unique situation. Such good advice. Unfortunately, many people don't acknowledge that their pets even have feelings. Great advice and information. Thank you! I find so many people do not take their pets emotions into consideration because they are so selfish thinking of themselves. I will pass this along to my clients. After all they are our family members too!!! This is a great article, very import info for owners to be aware of! Separation Anxiety can be very difficult for both dog and owner. Great article! Stress can be very hard on our beloved pets. I have started using an essential oil blend on my dogs back paws (diluted) for times during thunderstorms and when at the groomer. I'm hoping that I won't have to go through the other issues that may cause stress to my pets. Good guidance for events that can be so traumatic for people. And yet people can easily overlook the stress and pain these events can cause their animals. Thank for covering this topic. Important for everyone to consider when they have a live-change. Glad to hear research is being done, especially to help military dogs after they retire. Thank you! Many of us take our pet's emotional state for granted. Thank you for reminding us of their susceptibility to stressful situations. Stress peeing by dogs and marking by cats is another symptom of pet anxiety that I observed while caring for other people's pets. Our pets certainly reflect our lifestyle, both positive and negative, and we must be proactive when changes occur. My son left for college this year and one of our dogs has been very stressed out about it. It's cute that she's so happy when he comes home, but I feel bad for her the rest of the time. I will try some of the ideas from this article. This is definitely true. We had to move into an apartment after selling our house because our new house wasn't ready yet. My dog Brewster was so confused and stressed, and he is normally a really laid back dog. He had separation anxiety and scratched the carpet up in front of the door when we left him the first time. After that we were afraid to leave him alone because we were afraid what he would do, so we left him for very short periods (starting with 5-10 minutes) and gradually increased. We praised him and rewarded him every time we returned. Once he identified the apartment as "home" and became comfortable that we would always return, he was fine. I have an older dachshund I pet sit. She is blind and her hearing is not as good as it had been. The last two times I have taken care of her she has had a seizure. When she goes back home she is fine with no further problems. We think it is stress related and since I have read this article I'm convinced. Thank you for such good information. Great article by Dr. Jane and very informative comments. Because I work from home, my four dogs are definitely used to me being there. Normally, I have a radio playing while I'm working, so when I leave for awhile, I let the radio play. Nonetheless, when I return, I'm greeted by my dogs' chorus that I often interpret as "where have you been"! This is great advice, Dr. Jane. When my husband, Robert, passed away, my male cat would meow for long periods of time and sit in the chair he shared with my husband in the evenings. Then I was gone for days at time to be with my family and that's when both cats scratched up my furniture out of frustration, I assume. Five years later, they are attached to me and seem happy, but it took some time. Thanks for sharing this good piece of info. This is so true, especially with school beginning and the dogs no longer have their playmates around. This can be a factor in Doggy Depression. Thank you, Dr. Jane for some great advice!